The articles below cover a wide range of cat-related topics; from preventing cat scratching to preventing animal abuse around the world. Click on each article title to see the full text of the article. Nepeta Cataria(Catnip),the cat's Mint Julep. Six excuses for not spaying or neutering pets. Even if they can't pronounce the Latin name your cat would beg you to go out and buy or grow some "Nepeta Cataria" as soon as possible! Yes, that's the fancy scientific name for catnip, which is just a variety of the mint plant, but it's the party treat that all cats adore.... Or do they? As with cats, the interesting point about catnip, and cats reactions to catnip, is in the variety of answers to this question. Catnip can be grown in places as distant as Australia, South Africa, Italy and Sri Lanka, as well as in West Virginia, U.S.A. So which is the best? Well, do you like wine from France, Germany or California, or coffee from Brazil or Colombia? It's all in your individual taste buds, right? Well, so is the "taste" for catnip. Although catnip only requires a temperate climate in order to be grown, differences in the soil, sunlight, length of growing season, amount of moisture, average daily temperatures and other local growing factors can have an impact on the quality of the product. Some catnip may be better than others, but some cats like different catnips from others, too! Sprinkle a little catnip on the floor and watch the response! For about 5 to 15 minutes the cats will taste it, rub their cheeks in it, roll in it and generally act like they are a little drunk and very happy. It has no long-term effects. Most cats just get a little drowsy and doze off afterwards. If you ever have any lions, tigers or leopards in your house remember this as a way to calm them down! Yes, the big cats react to catnip just the same as the little cats do! That is IF they react. There are some cats that are party poopers and just don't have a reaction. Or some cats will have more intense reactions and get very excited, while others will just sniff a little while and look at you asking, so what's next? Male cats seem to have more intense reactions than females, but approximately 20% of the cat population will not react at all. Reaction to the catnip may cause your cat to take on a rather odd look with their mouth hanging partially open. This is because the cat has a unique taste/smell organ that has a passage leading from the roof of its mouth. Airborne particles are actually captured on the tongue and tasted, but then also flicked back towards the roof of the mouth to be "smelled". It is during the capturing and flicking action that the cat looks either like it is dumbstruck, or maybe perturbed with something, but it is actually just using one of its sensory organs. Male cats do this to track the smell of females during estrus, but all cats have it and it can be used at any other time, like when they are smelling catnip, as well! Catnip has never been found to be harmful and unlike psychedelic drugs in humans, it is not addictive. After the 5-15 minutes of trance response, the cat will show no signs of further effects. However, too much of a good thing can ruin the fun for your cats because evidently, if given too frequently, cats eventually become indifferent to catnip and may no longer respond. The right frequency seems to be no more than about once every two or three weeks to ensure your cats keep their "party animal" good-natured reaction! This means that the best way to buy catnip is not in a toy that you leave lying around the house for them to play with all the time, and lose its appeal, but only loose catnip that you sprinkle out for a "good time" once in a while. It you want to give your cat some of the best quality catnip offered on the market today, and know more about where I learned most of this interesting information, then let me introduce you to Catnip Trading, a new company formed by cat lovers Gene Kalb and Linda Pollitz. Gene and Linda decided that they wanted to form a business based on what they loved the most - cats. Catnip Trading sells catnip and treats from around the world, including small producers from the U.S., purposely providing products that are not available in pet stores or pet catalogs and that are only of the highest quality. They also offer treats (snack foods) from Holland, Germany, England and other locales in addition to catnip and they will not sell any product that they wouldn't feed to their own cats. As a matter of fact, they use their own and other family members' cats as their "test cats" to determine the quality and effectiveness of any product they sell, which only come from verifiably recognized companies worldwide. If their cats don't eat it or react to it, it gets a "four paws down" rating and doesn't get into their product line! When they ship out their products they include information on the history of the particular product and/or on the location where it was purchased. So you can feed your cat's fancy and your mind at the same time! If you think it is hard to have a person sit still for a portrait painting, just think what it takes to have an animal stay still for one! Well, the truth is that they don't. Janine Hutchins, a nationally known local artist who does portraits of pets, says that the best way to have them done is from a photograph. Janine also does caricatures of pets, which she prefers to refer to as "cartoons". Since these take less time, they can sometimes be done while looking at the live animal. Dogs are trained to "sit" so they may be good subjects for the quick cartoon sitting. However cats are "out of their element" whenever taken out of their homes and are too uneasy for a good portrait or cartoon. She says dogs will act "silly" and give a hint of their personalities and then "sit" again while the cartoon is being completed, but cats are too dignified and too distracted by strangers to do the same. Usually, Janine will obtain a photograph of the pet and she will then speak with the owner about the qualities and character of the animal, trying to get a sense of their feelings about the pet and what the owner feels is the nature of their pet. She will then try to bring these qualities out in her painting. Janine calls her caricatures "cartoons" because she thinks of a caricature as being exaggerated and not true to the real being. Her cartoons are complete with the actual body markings and full face of the animal. She adds a cute touch from the stories die owner tells about the pet. One owner explained that her pet absolutely adored pizza, so Janine did a cartoon showing it calling up for pizza to go! Incredibly, in the ten years that Janine has been drawing cartoons of pets she has done an unbelievable variety of animals. These have included horses, bunnies, parrots, chickens and even goats, but most frequently she does portraits of dogs and cats. She donates her time on occasion to sit and do cartoons at locations like pet stores to benefit animal humane organizations. She has done this for the Golden Retriever Rescue organization, for example, and will be doing so for Animal Umbrella as well! It seems that many people think about getting portraits of their pets after they are older or after they have passed on, but want to remember the pet "as it was when it was young". Fortunately as an animal lover and multiple pet owner (both dogs and cats!) Janine is able to bring out the best qualities of the animals as people have known and loved them. However, she strongly recommends taking good photographs of your pet in their best environment and then keeping those photos safely stored for the future. During her years of portrait and cartoon painting Janine has won many blue ribbons at art shows in the area. She owns her own studio in Groton called "Local Color" and employs five other artists who, by the way, do portraits of people as well as pets! Her studio also sells animal crafts done by her studio and by other local artists. She has note cards, pet beds, T-shirts or sweatshirts with a portrait, watches and even cat and dog biscuits in the shape of cats and dogs! The last question I asked her was - do pets really look like their owners? And she confirmed that they frequently do. So if an artist with a good eye says it is so, then I guess it must be true! And speaking of eyes, Janine is known for a very special touch in doing her portraits - the eyes seem to be following you no matter where you are in the room! Unfortunately, no humane organization including Animal Umbrella despite everyone's best efforts will be able to rescue all the cats and kittens left to fend for themselves during the bitter cold months throughout the state. There are simply too many homeless cats and insufficient space to shelter them. Attract animals to use garages, basements, sheds, barns, doghouses, porches, other specially-built structures, which offer repair from the elements. Make sure each place is as insulated, warm and dry as possible. Make bedding in enclosed sturdy boxes, with heavy woolen or flannel blankets. Place food and water nearby. If there are kittens in the area, try to capture them and find a foster home for them. If all fails, call Animal Umbrella and we will try to help. Keep special attention for older or weaker animals. If they look sick they may need to be taken to a vet for medical care. Never release a sick cat after treatment back outdoors because the likelihood is it will not make it. If a female appears pregnant, she should be spayed as soon as possible to avoid the birth of kittens in the cold months (February, March and even April) as they would never survive. 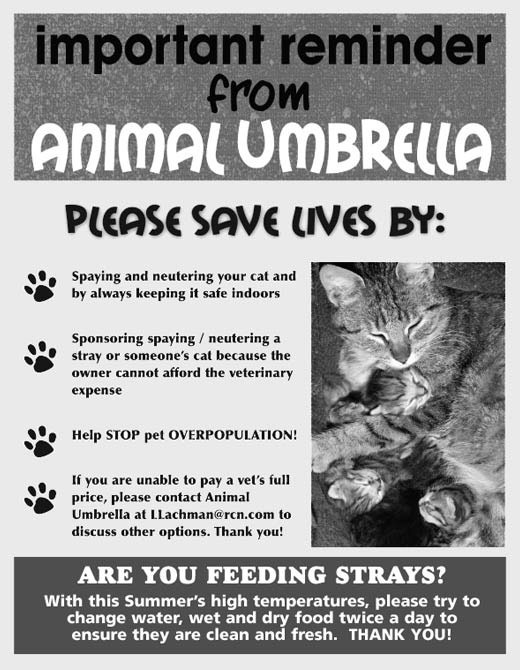 Use Animal Umbrella's low cost spay/neuter program. Never release an animal right after surgery as they may freeze to death. They need a few days to recover, especially females. If you know of an area with strays please find a number of people who will work with you on a daily feeding schedule. Food and water are ESSENTIAL IN THE WINTER! If for some reason you cannot feed the animals in an area please call us, as we may know someone else who could. If you find yourself in a particularly difficult situation please call us as we may able to provide some advice to lead you in the right direction. Reprinted from the brochure Should you Spayl Neuter Your Pet? published by Alfie Petfoods, Inc. Lehigh Valley, PA. Excuse Number One: My pet will get fat and lazy. Excuse Number Two: We want another pet just like Rover or Fluffy. Excuse Number Three: My pet's personality will change. Excuse Number Four: We can sell puppies or kittens and make money. Even well-known breeders are fortunate if they break even on raising purebred litters. The cost of raising such a litter--which includes stud fees, vaccinations and other health care costs, and feeding a quality food--consumes most of the "profit." Well-known breeders raise breeds that they like. These breeders also try to improve the standard of the breeds they raise. Excuse Number Five: My children should witness our pet giving birth. Excuse Number Six: I am concerned about my pet undergoing anesthesia. An interesting aspect of becoming an animal welfare issues activist is that one learns a considerable amount of information about the animals that we are trying to protect and save. But one also learns about people and how they apply their beliefs and prejudices towards humans to animals as well. Our society's fixation with youth and our rejection of old age often translate into people's preference to adopt kittens not mature or older cats. Because of this reason, most humane societies will not accept animals older than two years old because they are considered unadoptable. Animal Umbrella has never discriminated against age and will try to adopt any cat in need of a good home, even those with a physical handicap or a serious illness. Most of the calls we receive from people who want to surrender their animals are for older animals, because they are tired of them and are considered a disposable commodity. No one ever calls us to surrender a kitten or a very young cat. Actually, most people do not realize that mature cats are better companions as their personality is already developed and easy to detect and match to the appropriate household character. Mature cats tend to also be less destructive (on furniture and sofas) and their behavior is far more predictable. I adopted an older cat a few years ago, which was destined for destruction from my town pound. I remember how frightened Bianca looked in her cage, being bypassed by people over and over because of her age. She has now turned into a lovingly adoring cat that shows her devotion and gratitude to me and I give her attention and love. I am glad I adopted her then and I am happy I have recently adopted another older cat from a foster home. Sadly, because of his age his original owner was planning to kill him with a baseball bat. Zoar, like Bianca is immensely grateful to me for his second chance as if he knew I wanted to help him. So ageism towards animals is as bad as towards humans and totally unjustified. Sexism is another bias passed down to animals. We have learned over the years that most of the cats abandoned by people are females and their defenseless kittens. Although there are plenty of low cost spay/neuter programs, people do not take advantage of them to sterilize their animals. In becoming involved with a humane organization, I have come to realize how deeply spread animal abuse is. Cats in particular, have been the subjects of especially unjustified cruelty over the centuries. This cruelty unfortunately is worldwide and is still taking place today. The problems are the same everywhere: overpopulation and neglect, the direct hostility of many people, the lack of government/local funding to curb the population with massive humane spay/neuter initiatives. I believe that the negative image of cats (An image I believe resides mostly in people who have never owned one, and have never had the opportunity to appreciate the many qualities of these magnificent, intelligent and sensitive animals.) stems from the suspicions of the middle ages, when cats were identified with being instruments of the occult and evil. Because this image still lingers with many people, cruelty is more often perpetrated towards cats than dogs worldwide. Drowning newborn kittens. A practice used in many countries. Training dogs to kill cats and kittens. Abandoning cats and kittens on highways, parking lots, fields, everywhere. Leaving them locked in vacant apartments, houses, and abandoned/condemned buildings to die. Fortunately, however, cats have their friends as well. Millions of people worldwide feed strays, save cats and kittens from the streets, rescue the ill and injured, and many humane volunteer organizations sponsor spay/neuter/rescue/adoption programs. A growing number of cats are being adopted in U.S. households every year. The popularity of cats stems from their many positive traits. In general, cats are small, independent, clean, affectionate, intelligent and quite frequently playful. When planning to adopt a cat from a humane organization, people should learn as much as possible about the cat or kitten they are selecting including origin, etc.). They should adopt a cat whose personality and age will fit well in the environment of the new household. Medical records should be obtained, behavior should be observed. The animal should look healthy and alert. It will be helpful to learn about its diet and personal habits to create as little disruption to its routine as possible. It is important that the cat has been vaccinated, tested and spayed/neutered (age permitting) prior to being introduced to its new home. New owners should bring a cat carrier with them so that the cat can feel secure when being transported to the new location. Once in the new home, the cat should be left in a small room (possibly not a bedroom where it could hide under the bed for days) prior to being introduced to the rest of the house. A cat bed, litter, food and water should be placed in the same room. Chances are that the cat will not eat or drink for a while until it becomes accustomed to its new environment. Cats are naturally shy and need to slowly be introduced to change. People should sit on the floor if possible to stay at their level and talk to them gently. Brushing and special treats will also encourage the cat to trust the new owner. A week later or so, the cat should be introduced to the rest of the house (and new pets) by opening the door, sitting on the floor and allowing the cats smell each other. Cats should be petted at the same time to avoid any resentment. Chances are that there may be some smelling, hissing and growling between the cats, if this occurs the cat who is displaying this behavior should not be screamed at as later this negative experience will be associated with the other cat. Equal time should be given to all cats to avoid competition.